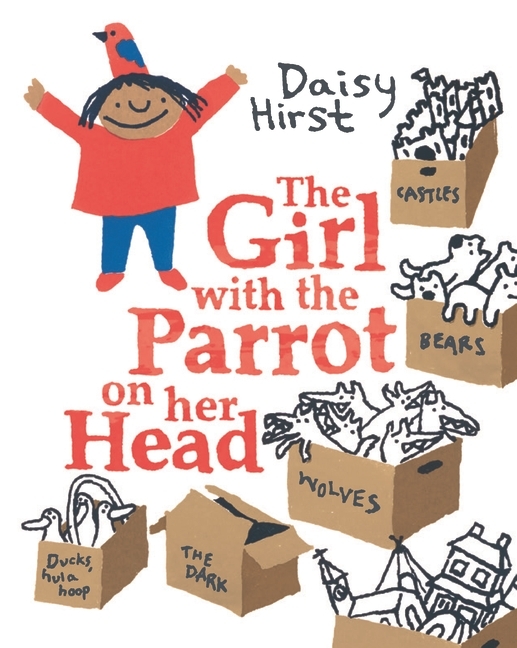 Earlier this year I enthusiastically reviewed the marvelous debut picture book from Daisy Hirst, The Girl with the Parrot on Her Head. Hirst's book subtly, thoughtfully and genuinely addresses the emotions of loneliness, anger and fear in a small child while simultaneously creating a setting and story that captures the imagination, creativity and curious logic of children. And, as with all the best picture books, Hirst makes this all seem effortless. Whatever countless hours, months and years of work that went into creating her picture book become an seemingly effortlessly engaging, charming story that leaves readers and listeners with so much to talk about. 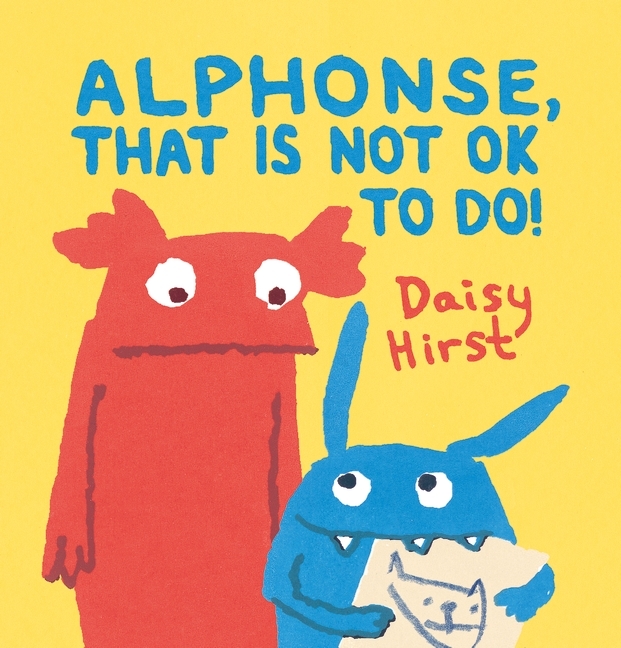 Hirst accomplishes the same magic with her new book, Alphonse, That Is Not OK to Do!, a sibling story that is a joy to read. In fact, I read it over and over to kindergarten, first and second graders the week before writing this review and I discovered something new and wonderful about the book with each reading. And, as with her debut book, Hirst's new picture book gives readers and listeners so much to think and talk about. Alphonse, That Is Not OK to Do! begins, "Once there was Natalie," and we see a happy red monster swinging as she holds her parents's hands. A page turn brings the arrival of Alphonse. While Natalie's facial expression is less than cheerful, she, "mostly did not mind there being Alphonse." 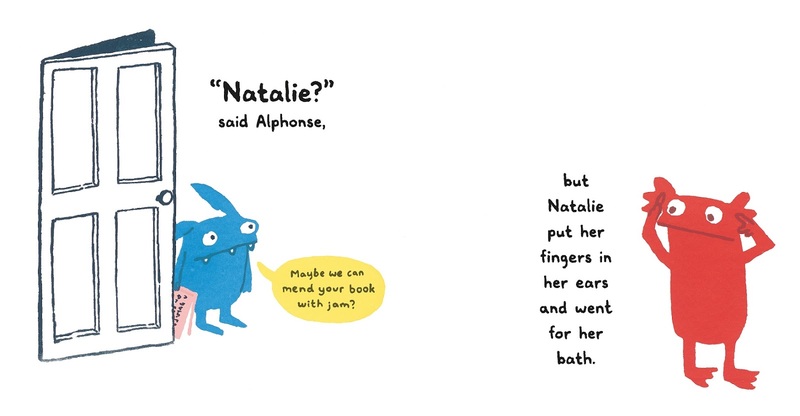 We see the two playing together, making things together and naming pigeons together, but we also learn that sometimes Alphonse draws on things Natalie has made and occasionally eats her books, which she hates. One day, when things aren't going well for Natalie, Alphonse sends her over the edge. She finds him under the bed, eating her favorite book. If you look closely you will notice that Alphonse is eating A Bargain for Frances by Russell Hoban which, Hirst's bio reveals, was her favorite audio book as a child. She tells him that is not OK to do, then draws an angry picture in which a tiny Alphonse is being assailed by "a tornado, two beasts and a swarm of peas." Alone in her bath, Natalie becomes worried when she thinks she hears her drawing come to life. 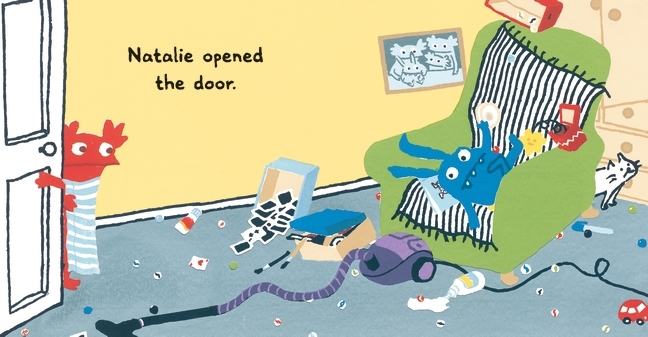 In a very clever twist that took me a reading or two to notice, the sounds that Natalie hears (which are being made by Alphonse as he tries to get the tape to repair Natalie's book down from a high shelf with the vacuum then a chair) do actually echo the sounds that her drawing might make. Natalie is scared, and remorseful. A two page spread shows her at the right corner of the recto, wrapped in her towel and looking worried. A page turn reveals the scene below. Hirst ends her book with an explanation and apology from Alphonse, which Natalie responds too with sweet concern and her own apology for being mean. Alphonse then shows Natalie that he finished her picture and her expression is one of trepidation. Happily, she thinks it is "Most Excellent Fantastic!" and the two go on to draw more together. I realize that I basically told the whole story of Alphonse, That Is Not OK to Do! here, but I wanted you to get a feel for the excellent story telling on display as well as the superb, caring character that is Natalie. There are teachable moments in this book and moments where you will want to stop and talk with the listeners. Best of all, there are no adults in this book, allowing Natalie and Alphonse to work things out themselves, which is so much more powerful than having mom or dad come in and sort things out. For a glimpse into the long process of writing this book, and the collaborations along the way that shaped it, read Hirst's contribution to Picture Book Party, a blog by Walker Books UK, partner with my favorite publisher of picture books, Candlewick Press.